Desperate times call for desperate measures. Sophie’s two precious towels, which have comforted her since infancy and which I last wrote about in September 2012, are continuing their slow but inevitable decline into dust. Random pieces of fabric fall off on a regular basis. They are filled with holes. You’d never know from looking at them that they were once square-shaped. We haven’t washed them in at least a couple of years because they would never survive the ordeal. Frankly, if I were an enterprising dishonest person, I would try to to pass them off as sacred religious shrouds in order to make a quick buck. Because as much as they looked like the Shroud of Turin 16 months ago, there’s no doubt about the uncanny resemblance today – minus the mysterious Jesus-like image. But that’s ok, because we have artists in the family who are capable of decent forgeries. Yesterday, Sophie came into our bedroom with an extreme look of concern on her face. “Mom, I don’t know what to do! I’m afraid to sleep with the towels in my bed because if I accidentally tug on them, they’ll rip. So I put them on my night table. But then I’m not able to sleep with them!” My little one was practically in tears. I am best known around the house for being Finder Mom. But sometimes, I wear the Fix-It Mom hat, too. And last night, as she was preparing herself for bed, she reminded me that we needed a solution for her disintegrating towels. I put on my thinking cap. I looked in my closet and found a small soft bag that was previously used to protect shoes. It was the perfect size. I showed it to Sophie, who smiled. 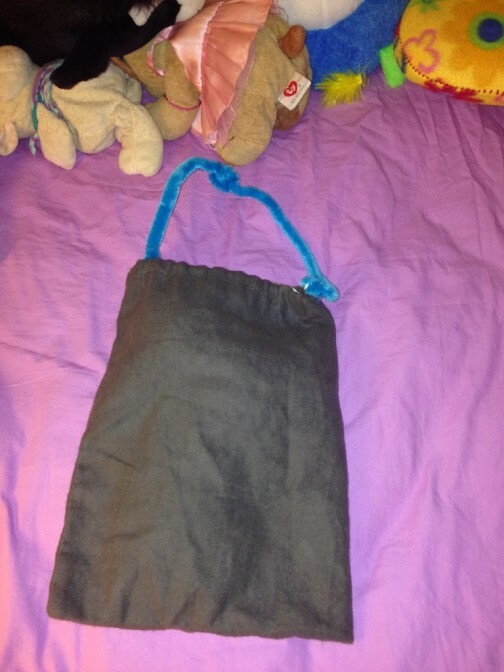 She found two fat and fuzzy pipe cleaners and embellished the bag with a new handle. She carefully folded her two most cherished possessions and placed them lovingly in the recycled sack. The bag, which is honored to have been promoted to such an important position, now serves an essential function as Sophie’s royal towel preserver. And Sophie can rest easy knowing that she and her towels will probably be able to celebrate at least a few more birthdays together.